Nylon is the strongest of all ropes in common use. When stretched it has a "memory" for returning to its original length. For this reason it is best fir absorbing shock loads. Nylon lasts 4-5 times longer than natural fibers because it has good abrasion resistance and is not damages by oil or most chemicals. 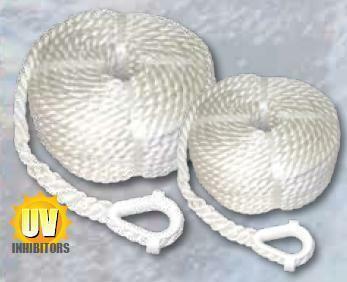 nylon also has good resistance to ultraviolet deterioration from sunlight, referred to as "UV stability". White color, 100% nylon.